First, keep in mind that the Class Mods work differently than most items! For instance, the left/right side parts and the manufacturer materials, depending on the body used will affect it differently. Furthermore, if you were wondering, it is possible to use Class Modifications/effects from another class on any class mod, just don't expect the other classes Action Skill to do anything though once equipped. Lastly, the item type is what tells the game what class or character can equip it or not, so long as that the name matches your class, then you will be able to equip it no matter what body it has, since the body corresponds with the character, and manufacturer used. I think I'm confusing you, so let's just jump right in! Quality [1-5] scales all effects. 5 is best. Yes This identifies the base class of the item and along with it, the slot where it can be equipped. For class mods, this will always be gd_itemgrades.Gear.ItemGrade_Gear_ComDeck_<Name>, where <Name> represents the character. Yes This identifies the sub-class of the item and along with it it may identify the person who can equip the item. For class mods, this will always be gd_CommandDecks.A_Item.Item_CommandDeck_<Name>, where <Name> represents the character. Yes This identifies the body to be drawn in the game and along with it, additional bonuses granted by the item. For class mods, this will always be gd_CommandDecks.Body_<Name>.<Name>_<Subclass>, where <Name> represents the character and <Subclass> represents the subclass. No For multi-part items (such as class mods) this identifies the left side to be drawn in the game and along with it, additional bonuses granted by the item. No For multi-part items (such as class mods) this identifies the right side to be drawn in the game and along with it, additional bonuses granted by the item. Yes This identifies the material to be drawn in the game and along with it, the appropriate sub-class bonuses based on body that will be granted by the item. Yes This identifies the body to be drawn in the game and along with it, the basic stats of the item. No This identifies the prefix to be shown in the game (as a prefix to the item's name) and along with it, it may identify additional bonuses granted by the item. Yes This identifies the title to be shown in the game (the item's name) and along with it, it may identify additional bonuses granted by the item. For class mods, this will always be gd_CommandDecks.Title.Title_ComDeck<Name>, where <Name> represents the character. The following table contains the bonuses (for each effect) granted by various bodies (gd_CommandDecks.) of all quality levels. Body_Loyalty.Loyalty_Lilith_Eridian ? ? ? ? ? ? Weapon Damage ? ? The material determines the bonuses to be applied based on the body of the class mod (which is basically the sub-class of the character). The manufacturer of the material appears to be irrelevant (hence it is omitted from the table below); only the ID of the material seems to matter. It appears that materials with ID=1 do not give any bonuses, while materials with ID=2 and materials with ID=3 give different bonuses. The following table only applies to the [gd_manufacturers.Manufacturers.] section of class mods, describing the required levels based on the quality level for each manufacturers. 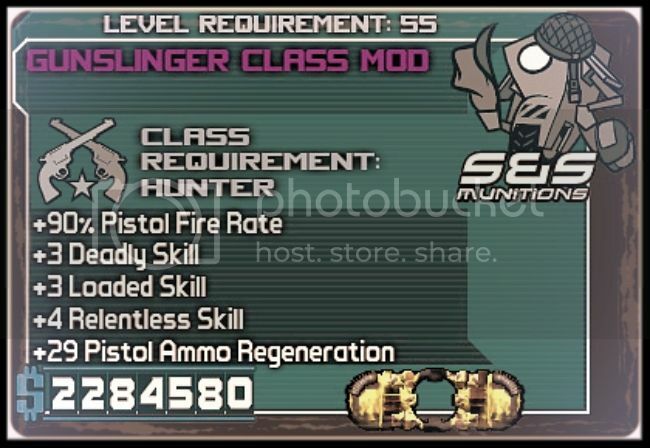 As you can see all manufacturers (that actually manufacture class mods) require level 48 for a class mod of quality 5. There are 6 different right sides (apart from "rightsidenone" that appears to be the blank part). The right sides further improve the "Default Effect" and "Manufacturer Effect" bonuses. The right side bonuses are added to the Default and Manufacturer bonuses that have been already scaled by the quality; meaning that quality does not have any impact on the right side bonuses. Furthermore, it seems that the second last digit in the Name of the class mod is determined by the right side (see the "Naming" columns in the right side tables below). There are 7 different Class Mods for Roland I found. These Effects on skill bonuses are all in the same pattern. Look at the table below: This stands only for quality 5 class mods. Lower qualities might have lower skill boosts. The right side bonuses for Roland's Heavy Gunner Class Mod (Quality 5 only, different qualities could change the numbers). Material_1 gives no bonuses. rightsidenone gaves the same bonuses as rightside1 in the tests. The remaining right side bonuses for Roland are to be investigated. 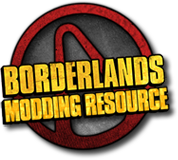 There are 7 different Class Mods for Mordecai. The actual right side bonuses for Brick are to be investigated. The actual right side bonuses for Lilith are to be investigated.